Debuted at the 2018 Fort Lauderdale International Boat Show, the 230CX is the newest model in EdgeWater’s dual console line-up. Using the same hull as their 23ft center console center console, this 23ft dual console packs a big punch for its size, and it’s perfect for the family who is starting their boating adventures or the seasoned boating veteran. Whether you are looking for a day of fishing or simply getting the family out to the sandbar, the 230CX is up to the task. Backed by legendary Edgewater lifetime hull warranty as, it is sure to provide a lifetime of fun, trouble free boating. With the same deep-v hull as the EdgeWater 230CC, the 230CX offers phenomenal offshore performance, while maintaining a 15” hull draft. At the transom you will find mounted rod holders, a built-in fish box and a 28-gallon insulated live well that can double as a cooler on the days you won’t be fishing. The 230CX also comes standard with a fresh and raw water washdown and a full prep station complete with a sink. 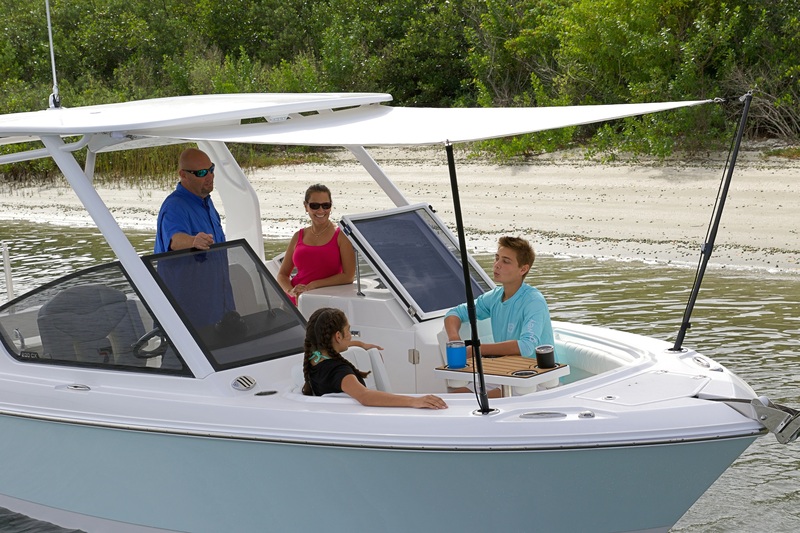 Removable cushions on the transom seating create a more spacious cockpit with a large casting platform, and they easily snap back into place if you need extra seating for the family. 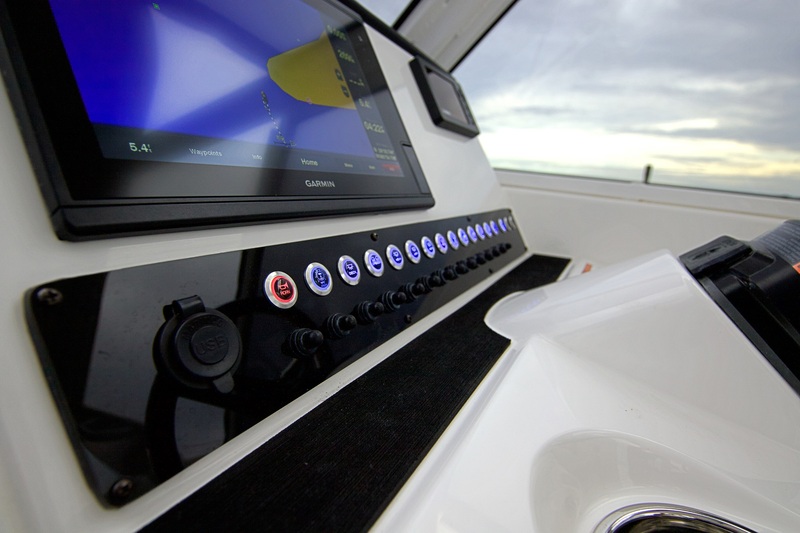 At the helm you will find enough space for either a 10” or 12” Garmin, a VHF radio and a Fusion stereo system. 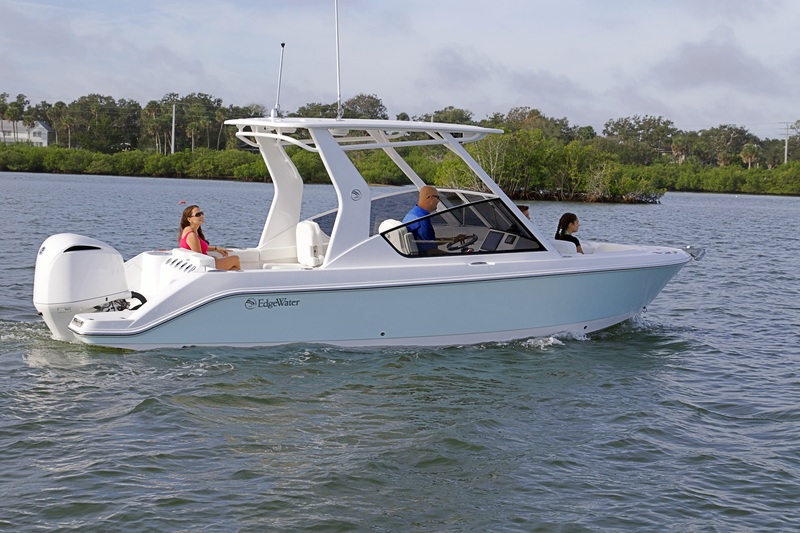 The 230CX also has the option for auto-pilot and radar for boaters who love to run offshore or take trips down to the Keys. On the portside there is an enclosed, vaccu-flush pump-out head, ensuring you won’t have to cut your day away on the water short. EdgeWater is known for providing all the necessary comforts without sacrificing performance and fishability. The Edgewater 230CX may be the smallest crossover by Edgewater, but this boat leaves nothing on the table. 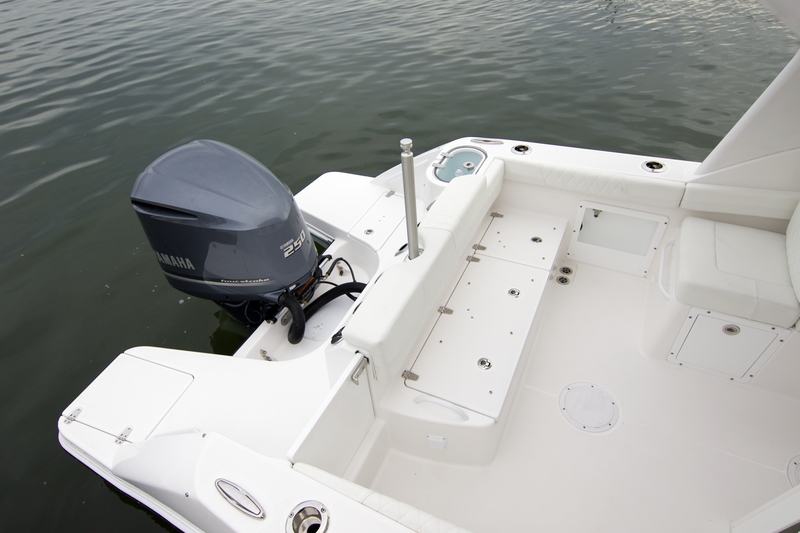 Powered by a reliable Yamaha 300hp 4-stroke V6, achieving nearly 50mph speeds, this boat is sure to put smiles on the faces of all aboard. Whether you’re looking to fish or just take your family out on the weekends, the Edgewater 230CX is a perfect choice for both new and experienced boaters alike!